One of the first things to catch my eye was an empty alleyway with shadows of palm trees painted on the side of the building. I had to do a double take to make sure they weren’t real! It was a cool juxtaposition of organic and urban, and so Phoenix appropriate. I was definitely starting to feel inspired! As I continued exploring, I found many spots that interested me, but it wasn’t until I saw the chalkboard that I knew I had found my second point of inspiration. 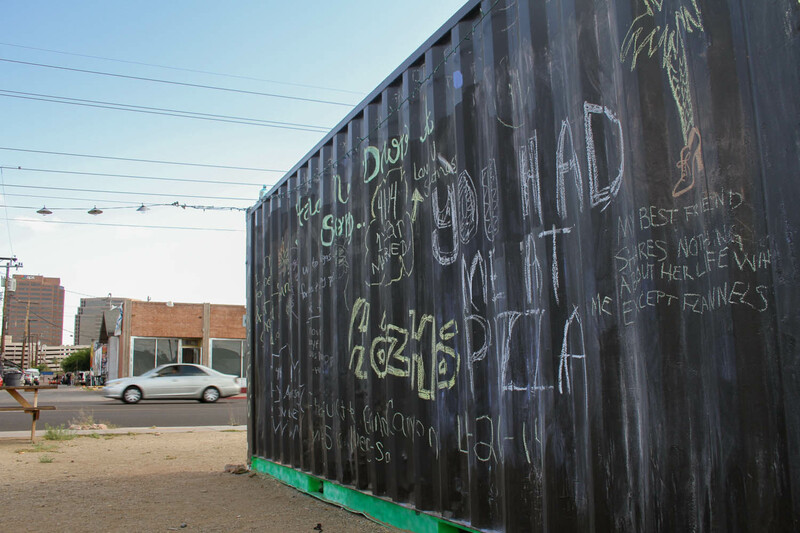 The portable storage unit had been painted with chalkboard paint, and then passing people had doodled on it, written stories, confessed truths, and declared their love for pizza. By this point, I was raring to go on my nail design inspired by these two spots. I knew I wanted to combine them together, so I assigned the palm tree silhouette to my accent nail and chose to go with stream-of-consciousness style doodles on the other nails. Give them a try… I bet they are easier than you might expect! Paint your nail with the Sally Hansen I Heart Nail Art Neon in Pretty In Hot Pink. Let it dry completely before moving on to the next step. Using the Sally Hansen I Heart Nail Art Pen in Black, draw on some random doodles and shapes. Grab the nail art brush from the Sally Hansen I Heart Nail Art Tools Kit. Fill in the shapes with Triple Shine nail color in Dive In and Vanity Flare, and the I Heart Nail Art Striper in White. You can also use the dotting tool to fill in empty spaces between shapes. Let the manicure dry completely before finishing with a coat of topcoat. Paint your nail with Sally Hansen Triple Shine Nail Color in Dive In. Let it dry completely before moving on to the next step. Using the Sally Hansen I Heart Nail Art Pen in Noir, draw on a palm tree trunk that starts wider at the base and tapers in. Sketch on the outline of the branches, and then fill them in. Let the palm tree silhouette dry completely before finishing with topcoat for seal and shine. I loved my city before, but there’s really something to be said for taking an afternoon to explore and find some of its hidden gems. I realized that we all want to be connected, we all want to make something beautiful, we all want to feel inspired and share our stories. I know I found my inspiration, and I hope you feel inspired to explore your city’s treasures now, too. Be sure to check out Sally Hansen's #iHeartNailArt contest and enter for a chance to win $500 and a trip to NYC to compete in the Grand Finale*; the grand prize is $2000! Enter at www.sallyhansen.com. This month's theme is Liquid-Mani, so be on the hunt for some nail inspiration and enter before the deadline. *NO PURCHASE NECESSARY. Contest ends 7/31/14 Open to legal residents of the U.S. and D.C., 13 or older. Void where prohibited. See official rules at www.sallyhansen.com for full details including entry/voting periods & requirements, judging criteria, and limitations. Sponsored by Coty US LLC. This post has been sponsored by Sally Hansen. What a awesome post to read! Love how the nails turned out. So well done1 I love the inspiration behind this one! This makes me feel guilt for not painting my nails for a week! Had no idea you lived in Phoenix! I live in Scottsdale! :) Love your nail art! I'm actually located in Scottsdale, too! :) Thanks! Very nice, I work just next to Chandler in south Tempe, and I live in Scottsdale! 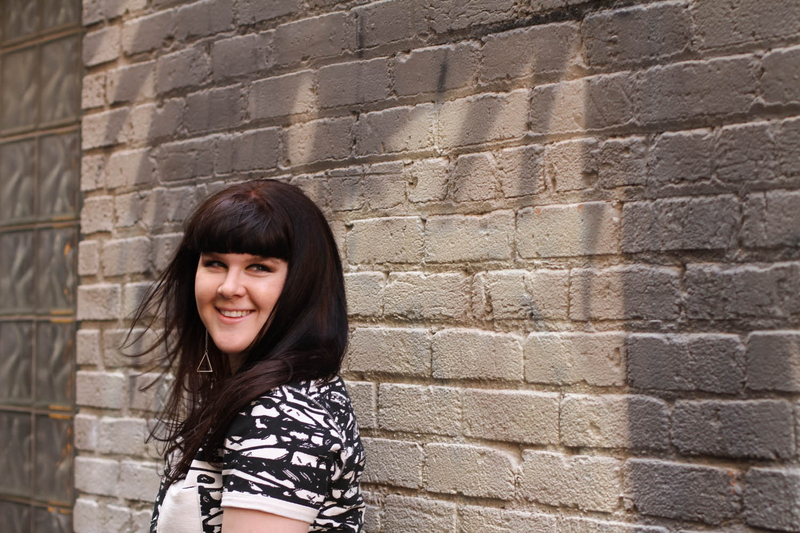 Sarah, you captured all the things I love about downtown Phoenix. My husband & I frequently go down there for date night. So many great places to visit!! Such a cute design, they look awesome! You should do beach themed nails that look like surfboards with waves!